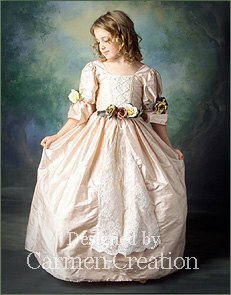 Our Madeline Renaissance Dress is a handmade one of a kind Victorian Dress, comes in most sizes. Our Madeline Renaissance Dress is a handmade one of a kind Victorian Dress, comes in most sizes. It is made of silk, and decorated with the highest quality flowers. All accessories are sold separately. Price may vary depending on the size. This dress is great for any occasion. If you have any questions please send me a message. Colors, trims and fabrics will very when the exact ones can not be found, similar fabrics, trims and laces will be used. The dress is still amazing and is always hand made, never mass produced.